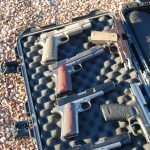 Spending the second day on the range at Gunsite with custom 1911s from Robar was an extraordinary experience! After using Glocks on the first day, trying to compare that with 1911’s on the second day is the well known apples to oranges comparison. With a history more than twice as long as Glocks, the 1911 is still an ever popular handgun. All that said, here are some observations after working exclusively with 1911’s on the second day. There was little doubt that each of the participants scored higher on the same proficiency test with the 1911s than they did with Glocks! One comment was that 1911s are more forgiving, but that has to be defined as the result of a shorter and lighter trigger press. Either way, the results were fantastic! The fundamentals skills don’t change and still must be well practiced, but there is no doubt one can be very accurate and go very fast with 1911’s! Did you want that in 45 ACP or 9 mm? But, on the other side of the coin, cleaning a Glock can be done quickly and there are fewer parts to keep track of! 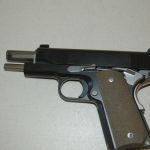 Why did that 1911 spring go flying trough the air as if jet propelled? 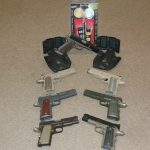 Just be sure that internal parts from either 1911s, Glocks or any of your other handguns are coated with Robar’s NP3. 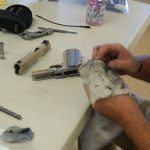 That facilitates the quick, easy and thorough cleaning of all the parts and pieces of any handgun. 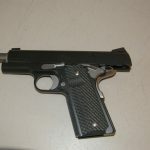 Below are pictures of the custom 1911s from Robar with a description. Also shown are Raven Concealment Holsters and the new SEAL1 cleaning kit.